Today, when it comes to food choices, increasingly savvy consumers place a premium on transparency and speed to market. They want to know where their food comes from, what is in it, and how fresh it is. Food processing, distributing and warehousing operations must account for such factors when selecting sites for their facilities. Locations in close proximity to consumers and producers can be the solution to meeting this growing demand. Henderson, Nev. is such a location. Centrally located between five major markets, Henderson is fast becoming a major hub for food manufacturing and logistics. Situated within a one-day’s drive from 61 million people, it has proven an ideal location for logistics operation to grow and thrive. Food manufacturers and distributors in Henderson can take advantage of the city’s proximity to major West Coast markets, including some of the fastest growing communities in the nation. In addition to the location, by choosing Henderson, these operations gain access to the region’s more than 204,000 skilled employees with experience in manufacturing, transportation and utilities. A population of more than one million lives within a 45-minute commute of Henderson-area business parks, allowing the opportunity for businesses there to attract employees for all positions and skill levels. That makes it easy for companies to recruit for their needed roles – whether that is in processing, distribution, warehousing or executive level management. 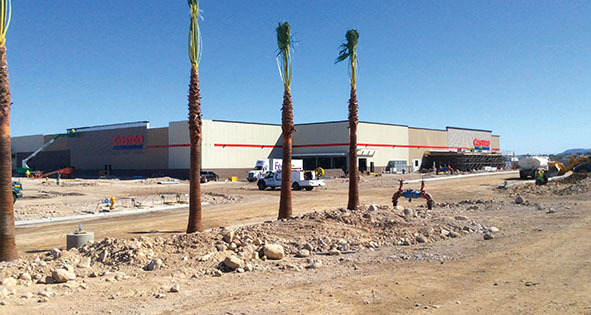 The new Costco adds to the budding food cluster in West Henderson, Nev.
Smith’s Food & Drug Centers, a subsidiary of The Kroger Co., wanted an additional presence in Nevada, and decided Henderson was the ideal location for the $13.5-million dry goods facility. This is the first food distribution center for Smith’s located in the state of Nevada. The facility will carry more than 8,000 different items, allowing the grocer to ship products to Smith’s stores in the Southwest United States, including throughout Nevada, New Mexico, Arizona and Utah. More than 450,000 people shop in Smith’s stores every day, and it is important to the company to have availability of food products on their shelves at all times. Henderson provides Smith’s great access to major highways including Interstate 15, US 93/95, Highway 146 and the Southern Nevada Beltway (I-215). Interstate 15 also provides immediate East-West access from California to the East coast via I-80, I-10 and I-40, as well as North-South access from Mexico to Canada via I-15. Henderson provides businesses diverse real estate options including greenfield sites, redevelopment and re-use options. With a diversifying economy and a maturing population, the future for Henderson and the entire Southern Nevada market is bright indeed. To learn more about what Henderson can do for your business, visit Hendersonnow.com or contact the Economic Development Office at 702-267-1650.